Root Canal Treatment involves the elimination of the infected pulp tissues and nerve of the tooth, the cleaning and shaping of the pulp chamber and root canals, and as a final point the filling and sealing of the tooth. Root Canal Treatment is essential when the pulp (soft tissue inside your teeth containing blood vessels, nerves and connective tissue) becomes inflamed or diseased. 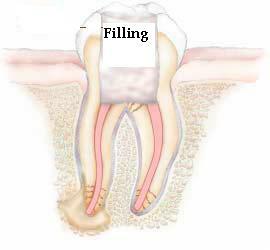 During root canal treatment, your dentist or endodontist removes the diseased pulp. 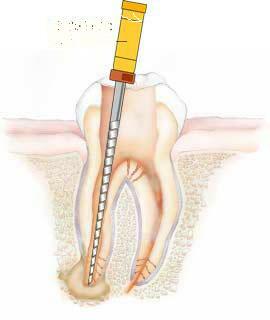 Procedure is started by drilling the enamel part of the tooth (topmost portion of the tooth). Enters into the pulp chamber, where the infected pulp is present. The pulp chamber and root canal(s) of the tooth are then cleaned.